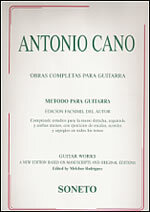 This important MÉTODO PARA GUITARRA is a didactic relation that A. Cano published after a Iony trajectory in his life as a teacher. A. Cano shows his idea through exercises for separated or both hands with mechanisms of scales, arpegios and so on. It's a useful method to intercalate it with other programmation texts. It's facsimile version garantees its original authenticity.